When reflecting on the most influential people in our lives, on the off the field, there is always one star that shines just little brighter than the others. One voice that carries just a little further. For the women of the Madison Blaze, that star, that voice, was our dear friend and coach Mark “Coach Mac” McLaughlin. We lost Coach Mac after a courageous battle with cancer on August 24, 2013. During the last week we’ve had the opportunity to meet and share stories with countless of other athletes who were privileged enough to have been coached by Mac during his time in the IWFL, the WFA, and Team USA. Our stories reinforced what we already knew: Coach Mac had a profound impact on everyone who met him. His influence on and contributions to Women’s professional football are far greater than many can fathom, and in our grief, we proudly pick up the torch and carry it forward to ensure that every athlete has the opportunity to realize their full potential. Coach Mac knew we were special before we knew, he believed in us, even when we didn’t believe in ourselves. He saw potential in every player that had the privilege to be on the sideline with him. He made time for players on the field, off the field, during practice, after practice, on the weekends, or whenever he could – he wanted us to see the potential in ourselves that he saw. To be our best. To challenge ourselves. To never, ever, give up. Coach Mac taught us the fundamentals of football and how to read an offense, he taught us the dynamic warm up and the important role that watermelon and cantaloupe play on game day. He taught us how to prepare for and how to NEVER underestimate our opponent, he taught us it was okay to make mistakes, that it was okay if you weren’t the most athletic player on the field, he taught us that if you could put a helmet and shoulder pads on, there was nothing that would stop you from learning the game he so dearly loved – that if you had the passion to play, there would always be a spot for you. Coach Mac taught us that no matter what your position or how much playing time you had, that you were important. He taught us how to play every down like it was our last, he taught us, that no matter what the color of your jersey, no matter what team you play for, we are a family. We would like to thank our friends, families and our amazing fans for your unconditional support during this difficult time for our team and fellow football sisters across the nation. 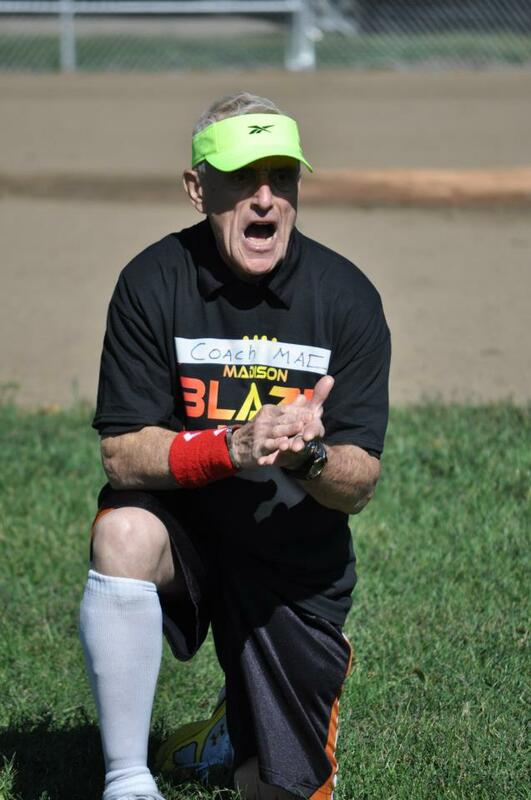 In honor of our beloved Coach Mac, the Madison Blaze would like to request that you to spend time with those who are most important to you, today and every day, to leave this world a better place in which you found it, to laugh and share what you have learned with others. As we say farewell to our beloved Coach, we take comfort in knowing that we will meet him again one day in the end zone of the greatest field of them all, and until then, we thank you, Mac. Integrated Sport and Spine Clinic of Madison LLC 2nd Annual Blood Drive<< >>Madison Blaze First Ever Team Mud Run!